Read your emails using only one shortcut email application! All themost popular and most used email apps, office mail, webmail appsare in one app now! Very fast and easy to use mobile live e-mailapp for you! Live mail apps are in one! Get your emails instantly!The email apps that you can reach with this app are: Gmail - Googlemail ( with gmail sign in) Yahoo email Aol mail Samsung mail Gmxmail Yandex mail Microsoft mail -Outlook mail Hotmail emailExchange mail Mail.ru mail provider Webmail Blue mail Proton mailMailchimp and more.. What you can do with EMAIL ALL-IN-ONE app:Check your mailbox, free email inbox, login email, read my emails,write e mail, send mail, create gmail, gmai mails, email sign incheck your inbox and much more of these... Comcast email is anotherpopular provider. Well designed email app! Do not use every emailprovider as your main email service! Some of the email servers arespammy and hacks your mailboxes. Be careful about problematic emailservices! This app only has secure and the most used free emailproviders, free email inbox for you! Well designed email app! Getyour emails instantly! Are you looking for a free, new emailaccount, you may also check for POP3 and IMAP free email services.These can be reached with Free Mail Box : All-in-one applicationtoo. Important Disclaimer: My emails app is a third party mobileapp that has shortcuts of popular, free email service providers.Users can login with their own credentials to email services to usethem securely. We do not save or keep any of these, as users canonly login with original,secure login services of these free emailservices! Meet Outlook for Android, the app that helps millions of usersconnect all their email accounts, calendars and files in oneconvenient spot. Newly redesigned, Outlook for Android lets you domore from one powerful inbox. See what matters most first with theFocused inbox that keeps the important messages on top. Switchbetween your emails and calendar to schedule your next meeting orshare your availability with just a few taps. Or grab a documentfrom your Files list and attach it to an email seamlessly. Witheverything you need only a tap away, managing your busy days is noweasier than ever. Outlook for Android works with MicrosoftExchange, Office 365, Outlook.com, Gmail and Yahoo Mail.------------------------------ Here’s what you’ll love aboutOutlook for Android: • Seamless inbox management with a focusedinbox that displays your most important messages first, swipegestures and smart filters. • Easy access to calendar and filesright from your inbox. • Features to work on the go, like Word,Excel and PowerPoint integrations. Google Play Store 2017 Android Excellence Program Winner TheVerge -“The fastest email app around...” Android Authority - “…usefulfeatures...great user interface…” TechCrunch- “…like you’ve giventhe mail app an upgrade…” CNET- “…imposes order on an unrulyinbox…” Email by Edison (formerly Email by EasilyDo) is a brandnew, elegantly designed, universal mail app to manage unlimitedmail accounts from different providers including Gmail, Yahoo Mail,AOL Mail, Hotmail, Outlook, Exchange, IMAP, Alto, iCloud and more.Engineered from the ground up, offering unparalleled speed and anintelligent assistant built-in to keep lifestyle essentials likeshopping, expenses, travel, and subscriptions organized. Email isthe ideal inbox replacement for your stock email app. With aseamless unified accounts experience delivered in an intuitivedesign for ultimate ease of use, Email by Edison makes mail the wayit should be. Email is 100% free to use--no hidden fees or plans tocharge you later. ALL YOUR EMAIL INBOX IN ONE PLACE MULTIPLEPROVIDERS - Create a unified mailbox with all providers. SupportsGmail, Yahoo Mail, Exchange, Outlook, Office 365, Hotmail, AOL,iCloud and IMAP mail accounts. Sync multiple mailboxes from allyour providers in a Unified Interface Supports Material Design& Lollipop FASTER & SMARTER MAIL LIGHTNING FAST! - No morewaiting for messages to load, this is the FASTEST email appavailable for Android. BUILT-IN INTELLIGENT ASSISTANT - View keyinfo including Attachments, Bills & Receipts, and Entertainmentacross your inboxes at-a-glance by category, without opening orsearching email. UNSUBSCRIBE FROM JUNK - Manage all of your emailsubscriptions in one place, tap to unsubscribe or star favorites.REAL-TIME TRAVEL NOTIFICATIONS - No more checking to see if aflight has a gate change or delay, Email proactively notifies youfaster than the airlines. Flights, hotels, and more in one place.PACKAGE TRACKING WITH PROACTIVE NOTIFICATIONS - No more searchingemail to find package tracking codes! Check the status of all yourpackages in one folder. PERSONALIZE NOTIFICATIONS - Customize yourmailbox Sounds and Vibration settings. SAVE TIME IN YOUR INBOXSEARCH BUILT FOR MOBILE MAIL - A full search engine on your phone.Fastest search of all folders by contact or keywords in an emailapp, even for super large accounts. UNDO SEND, DELETE, AND OTHEREMAIL ACTIONS - No regrets. Take email back even after it’s sent.ANDROID NOUGAT - Message grouping and quick reply fromnotifications. Access to launcher shortcuts for searching allinboxes or drafting a new message. ANDROID WEAR - Reply with voiceand receive notifications from your watch. CONFIGURABLE MENUS –Customize your swipe menu and email view actions. UNREAD MAILACROSS ACCOUNTS - Easily reference everything waiting to be read.MAXIMUM INBOX EFFICIENCY - Our extensive memory and battery testsensure Email is always running smooth. SIMPLE INBOX DESIGN DESIGNTHAT SIMPLY WORKS - No need to learn email all over again. APP ICONUNREAD BADGE – Count new emails in your inbox directly from yourhome screen. QUICKLY MANAGE ALL YOUR INBOXES - Reply to all youremail accounts from one simple inbox. Email supports Gmail, YahooMail, AOL Mail, Hotmail, Outlook, Exchange, IMAP, Alto, iCloud andmore! PRIVATE AND SECURE READ RECEIPT BLOCK - Preserve privacy byblocking read receipts from being sent back. Created by anartificial intelligence company that puts premium AI functionalityinto your mailbox. Please send us your feature requests andfeedback at [email protected] Special thanks to everyone whorates us 5 stars, or leaves kudos! Your support means a lot to ourteam! Take advantage of all Yandex.Mail features with your phone. Sendmessages no matter where you are. Get push notifications about newmail. With the Yandex Mail app you can: - send and receive messageswith attachments; - use push notifications so you no longer have tocheck your mail manually; - search your messages; - group messagesby subject; - filter messages by label, for example “Unread” or“Flagged”; - manage your Yandex Mail for domain mailboxes. Official mail application Mail.ru. Convenient Mail for smartphoneAndroid. Simple and fast application for simultaneous work withseveral Mail.ru, Yandex, Gmail, Yahoo, Hotmail and other mailboxes.Receive and send messages, share photos and documents. Getinstantly notified about new messages. Adjust the time, folders andservices for which you want to receive push-notifications. Personalspam filter will protect you from annoying mailings. Stay always intouch with the Mail.ru app! ★ ★ ★ ★ ★ Did you know that developerscan not respond to comments in Google Play? Therefore, anyrequests, suggestions and comments, please send via the "Feedback"in the app or email [email protected] In this case, we willrespond quickly and solve the problem as soon as possible. ★ ★ ★ ★★ - Multiple accounts support. Add all of your boxes and switchbetween them easily. Now, move between work and private email is assimple as between folders within a single mailbox. - Fullsynchronization. It does not matter whether you read, flagged, ormoved messages from a computer or mobile. All changes will be savedon the server and synchronized between devices. - Protected folder.Mail.ru app enables you to store information and protect it. Createa folder with a password in the web interface. It will be visiblein the application and accessible only after you enter thepassword. - Filters. View unread email, flagged email or emailswith attachments - Search the entire mailbox. Use our search engineto quickly find any email. - Push-notifications for new emails. Youwill be notified about new message almost instantly if your Androiddevice is connected to the network. - Filtering notifications. Seta time to receive notification, select services, folders or createa personal filter to receive only those alerts that are important!- Caching emails. Emails are stored in the phone's memory and areavailable without a network connection. Read messages and viewattachments in transport or, for example, in the countryside. -Personal spam filter. Do you get messages from services that youdidn't sign up for or can't unsubscribe from? Tap Spam and allsubsequent letters from the sender will automatically be sent tothe appropriate folder. Read only the important messages for you. -Avatars. It's easier and more convenient to navigate throughapplications with photos of recipients. - Email Threads. View yourentire email conversation on one screen, just as you did on the webversion. ★ ★ ★ ★ ★ The application has been tested and iscompatible with Android version 5.0 and higher. Beautiful design, Intuitive actions, Lightning speed, Advancedsecurity – In a new powerful email app for Outlook & others!Quick and easy access to Outlook and Hotmail accounts on the go!Check email, read, reply, send photos, add and view attachments —stay in touch with friends, family and colleagues. Experience newfeatures to manage your Outlook email on your phone, tablet, orsmartwatch in the most efficient manner. Why choose us? – Timelycustom push notifications for each individual email account, e.g. 'Work' email address set to ‘Do not Disturb’ mode from 21:00 to7:00 – User-friendly design: you do not have to think twice,whether you want to Flag, Mark as spam, Delete just one or multipleemails at once – Clean and tidy inbox with contact avatars and anoption to enable email threads (all conversations displayed neatlytogether) – Convenient search by Date, Recipient, Subject, inUnread, Flagged messages or Attachments to help you find emails ina flash – Personalized filters to automatically move incomingemails to specific folders or Mark them as read – Enhanced securityto protect your mobile app against unauthorized access by settingup a PIN password The application also supports all major emailservices that you can add to have all your mail in one place,whether it is a Microsoft Outlook, Hotmail, MSN Mail, Gmail, Yahoo,AOL, GMX or any POP/ IMAP/ SMTP-enabled mailbox. If you encounterany problems, send us an email at [email protected] and we willtry our best to help you in a timely manner. IMPORTANT: We are afree unofficial Outlook email application with a goal to provide anexcellent mail management product. Beautiful design, Intuitive actions, Lightning speed, Advancedsecurity – In a new powerful universal email app for email! Quickand easy access to Hotmail, Gmail, Outlook, Exchange or Yahooaccounts on the go! Check email, read, reply, send photos, add andview attachments — stay in touch with friends, family andcolleagues. Experience new features to manage your email on yourphone, tablet, or smartwatch in the most efficient manner. Whychoose us? – Timely custom push notifications for each individualemail account, e.g. 'Work' email address set to ‘Do not Disturb’mode from 21:00 to 7:00 – User-friendly design: you do not have tothink twice, whether you want to Flag, Mark as spam, Delete justone or multiple emails at once – Clean and tidy inbox with contactavatars and an option to enable email threads (all conversationsdisplayed neatly together) – Convenient search by Date, Recipient,Subject, in Unread, Flagged messages or Attachments to help youfind emails in a flash – Personalized filters to automatically moveincoming emails to specific folders or Mark them as read – Enhancedsecurity to protect your mobile app against unauthorized access bysetting up a PIN password The application also supports all majoremail services that you can add to have all your mail in one place,whether it is a Yahoo, Hotmail, Outlook, MSN Mail, Windows LiveMail, Gmail, AOL, GMX or any POP/ IMAP/ SMTP-enabled mailbox. Your email inbox should help you live and work better, but insteadit often buries the important stuff and creates more stress than itrelieves. 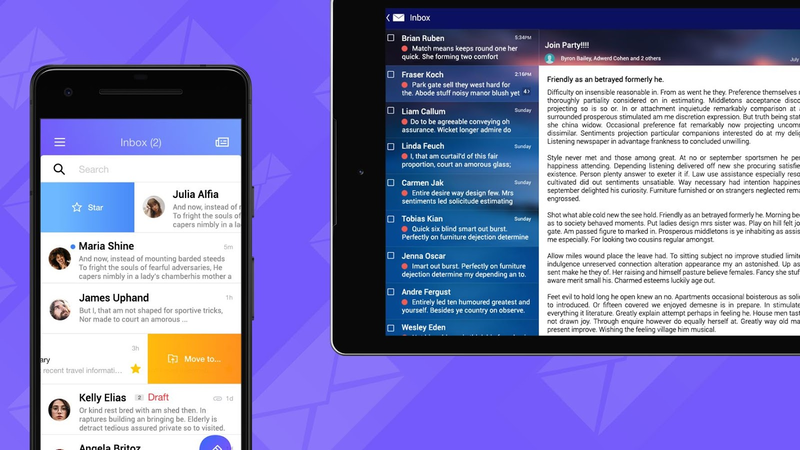 Inbox, built by the Gmail team, keeps things organizedand helps you get back to what matters. • HIGHLIGHTS - Get the mostimportant information without even opening the message. Check-infor flights, see shipping information for purchases, and viewphotos from friends right up front. • BUNDLES - Similar messagesare bundled together so you can deal with them all at once. And getrid of them with one swipe. • REMINDERS - More than mail, you canadd Reminders so your inbox contains all the things you need to getback to. • SNOOZE - Snooze emails and Reminders to come back whenyou are ready to deal with them: next week, when you get home, orwhenever you choose. • SEARCH - Inbox helps you find exactly whatyou’re looking for— from your upcoming flight to a friend'saddress— without having to dig through messages. • WORKS WITH GMAIL- Inbox is built by the Gmail team, so all your messages from Gmailare here, along with the reliability and spam protection of Gmail.All of your messages are still in Gmail and always will be.